Good Eats 'n Sweet Treats: Giveaway Winner! I hope everyone is having a wonderful Memorial Day, spending it with friends and family. Many heartfelt thanks go out to all who have served our country. Now for the big news! I want to thank everyone who entered my latest giveaway. All in all, we had 156 entries. 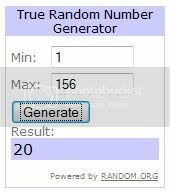 I used random.org to choose the winner. So who was the lucky recipient? The winner of the $100 gift card to Carrabba's is #20, Sarah of Passion and Paradise! Congrats Sarah! I hope you enjoy your next meal at Carrabba's! I will be emailing you with details on how to claim your prize. Hey Jaime! What a great giveaway :) I don't know where your follow button is to follow you!